Before proceeding with cloning, shut down the virtual machine. You can clone the virtual machine using virt-clone or virt-manager. You can use virt-clone to clone virtual machines from the command line. Note that you need root privileges for virt-clone to complete successfully. The virt-clone man page also documents each command option, important variables, and examples. 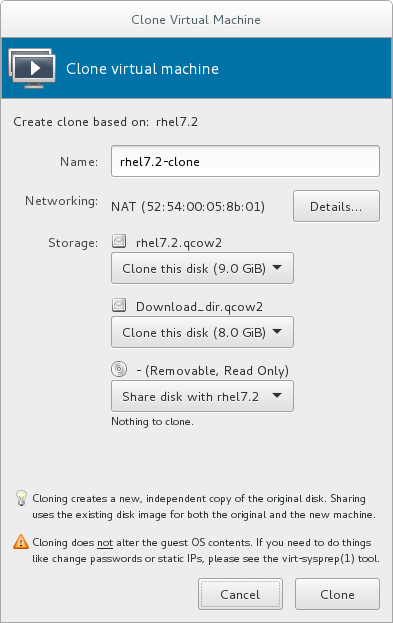 The following example shows how to clone a guest virtual machine called "demo" on the default connection, automatically generating a new name and disk clone path. The following example shows how to clone a QEMU guest virtual machine called "demo" with multiple disks. This procedure describes cloning a guest virtual machine using the virt-manager utility. Select the guest virtual machine you want to clone from the list of guest virtual machines in Virtual Machine Manager. Right-click the guest virtual machine you want to clone and select Clone. 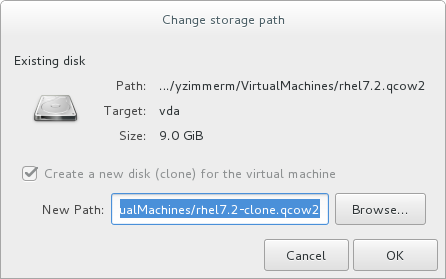 The Clone Virtual Machine window opens. To change the name of the clone, enter a new name for the clone. To change the networking configuration, click Details. 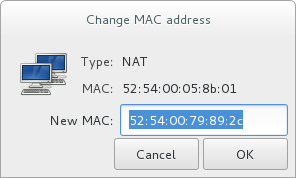 Enter a new MAC address for the clone.